The reputation of Laurier’s Faculty of Music is second to none. Voted Canada’s best music campus by CBC Radio, the faculty played a role in the making of award-winning Canadian musical talents such as composer John Estacio, singer-instrumentalist Kevin Ramessar and opera singer Jane Archibald. In addition to its esteemed graduates and instructors, the music faculty holds another accolade – something unique among Canadian universities – a Master of Arts degree in Community Music. Launched in 2013, Laurier’s master’s program in community music is a part-time, interdisciplinary offering that leverages service-learning and leadership within a musical context to develop personal and community growth. As an academic discipline, community music is a collaborative, inclusive and holistic approach to making music. The program attracts students drawn to creating community through music rather than the perfection of the music. “Laurier’s master’s program in community music allows students to get out into the community, break down walls and bring people together to facilitate change,” said Lee Willingham, associate professor of music education and the community music program coordinator. Community music originated in the United Kingdom. During the 1980s, underprivileged areas in major urban centres lacked access and exposure to the arts. Realizing this, local councils and education groups sought government funding to bring community musicians to the schools, engaging students in an inclusive – and enjoyable – approach to music and learning. The students and their communities experienced transformative outcomes, resulting in community music rapidly developing into a field of scholarship and a vehicle for social change. Laurier’s community music program draws on concepts from Indigenous studies, social work, health studies and the social sciences. Service-learning placements could include working with seniors’ residences, youth groups, arts organizations and other local groups to create feelings of belonging, joy and purpose. Second-year community music student Caroline Hissa works with youth facing socioeconomic barriers to music education in her role as the director of the Community Music School of Waterloo Region (CMSWR). Her program experience challenges her to push her own creativity to motivate and further engage her students. Hissa launched a new song-writing group for CMSWR’s teenaged students in January. The group of five students worked diligently to develop stronger composition and improvisational skills, two areas of importance for aspiring singer-songwriters. “The group really engaged in their creativity and expanded their musical horizons,” said Hissa. The inclusive, community approach to music provided a safe learning environment for two of Hissa’s students to conquer their fears of public performance, while another student with audio-processing issues pushed beyond his personal barriers. The song-writing group showcased their skills during a final performance in April. 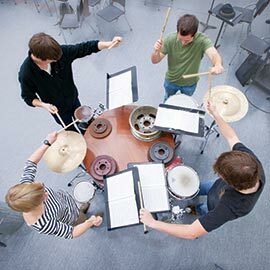 Laurier’s master’s program in community music accepts a limited number of part-time students each year. The faculty will offer a new undergraduate program with a community music concentration in September 2016.